"Suspenseful and moving . . . This author has a talent for telling a story and telling it well." - ABNA Breakthrough Novel Award "Like the nesting dolls of the title, the story moves backward through time, masterfully disclosing the mysteries of three generations of dysfunction. What we learn is that violence and alcoholism are not random, but historical . . . Lyrical and passionate, NESTING DOLLS is an excellent debut." -- Kaylie Jones, author of LIES MY MOTHER NEVER TOLD ME Seventeen-year-old Valentine never imagined her life as a fairytale. Growing up, she's barely getting by, spending her time, energy, and money caring for her younger brother, Jonathon, and herself. Her mother lives recklessly and selfishly, occasionally sobering just enough to see her children through glassy eyes. After yet another violent episode involving her mother's boyfriend, Valentine decides to run away, taking Jonathon with her. In search of a better life, she gets half-way across the country . . . only to receive such shocking news, it forces her to turn the car around. Twenty years earlier, Valentine's mother Theresa, the privileged daughter of a small-town police chief and a strict, repressive mother, finds herself desperate and devoid of options when she lands in Los Angeles, 13 years old, pregnant, and utterly without a clue. Life on the street is ten times meaner than she ever imagined, and as she struggles to get through each day, week, and month, she holds on to the hope of finally getting herself back to upper-class suburban bliss . . . if she can only make it out of LA in one piece. And twenty years before even that, in suburbia, Theresa's mother, Caroline, plays the part of doting wife like a pro, but behind the designer skirts and lipstick smiles lies a married life of severe physical and emotional abuse. After having two children, Caroline settles into the idea of living in home with a man who terrifies her...only to have the love of her life show up on her doorstep, asking her to make a choice that will forever change her path and those of the women who will come after her. 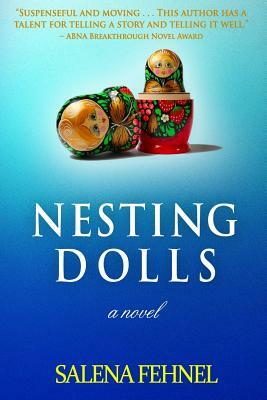 NESTING DOLLS is the multigenerational story of three women, how their lives connect and diverge, and how they support or betray each other due to circumstances and the choices they make. Their lives each span a different time, a different life, but ultimately converge in a single theme: how mothers and daughters are truly bound together forever, no matter what they may imagine, dream, or regret. "By turns poignant, funny, and frightening, NESTING DOLLS is a gorgeously-written reverse fairy tale the reader will be reluctant to set down." - Lenore Hart, author of BECKY and THE RAVEN'S BRIDE. Salena Fehnel bears the brand of a bi-coastal adult, gravitating toward sunshine and salty waters. Her fiction, nonfiction, and poetry has been published in East Meets West, American Writer's Review, The Cohort Review, Calliope, and in the national bestselling anthology My Parents Were Awesome. She teaches writing and literature at Berkeley College in New Jersey, where she savors students' first experiences with great fiction writing. She shares her home in the Poconos with her husband, their daughter, and their overly-snuggly Great Dane.